Themed playlists can be fun to make and great to listen to. Think of something that connects the songs together. It could be in the title, in the lyrics or the name of the band, or just some personal connection you have made to the theme. We will give you a theme and you tell us why the song you suggest fits in that theme. We will put it together and share it with you next time. We have to start somewhere so today’s theme is French Canadian. You don’t need to know what they are saying to enjoy these tracks but they sure can make you wish you did. Feel free to suggest more to be added to this list. Enjoy! Theme for next time: Thanksgiving. Comment below with your suggestions! Being picky, I don’t agree with the above illustration: it confuses French the language and French the nationality. 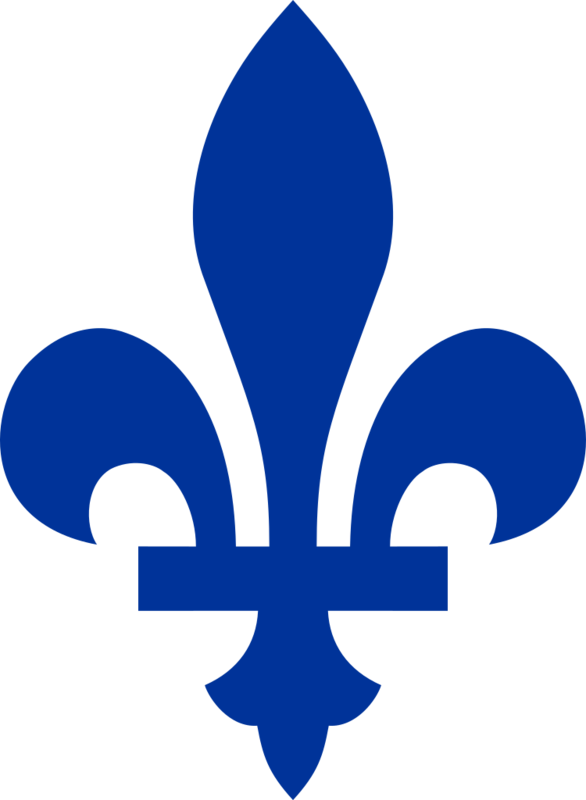 Outside of France being the origin of Québec, that province has nothing much to do with the French flag. Neither does New Brunswick. Consider this: are English(-)Canadians represented by the Union Jack? Only some. (In Victoria, to an extent.) Very many English-speaking Canadians have roots other than English. It’s a minor point though. Probably not, as it’s mostly know in the regiment. It’s certainly the first time I see it. Don’t worry about my previous comment. Good morning! Great playlist Darbar! Thank you Darlene. Looking forward to listening to the playlist later today. Garfield: Hahahahahahaha! A GIANT fluer-de lys! Thanks for getting that up Garf. It was put together rather hastily. With more time I would have put the list in some kind of order and tried to write something more intelligent. Try. @BfO, Don’t blame me, I copied your spelling from 6:25. I tried to reduce the size of it but it looks like it scales to width. @DBS, You did all of the work, I just had to copy and paste. I was just going to put the Galaxie cover as the photo but you had to find an appropriate image. Teamwork. I have started the playlist for Thanksgiving so maybe I will be able to get that one in order for next week. Taking suggestions for both playlists. I am sitting in the waiting room at the dentist while my son gets his teeth scaled right now but later I can add them. There are a whole lot of Montreal artists I love but I was concentrating on songs in French more. isn’t Radio Radio from NB? I will look those up krib. It is French Canadian not just Quebec that I was going for. I think I will look for Etienne Fletcher from Indigo Joseph as well, but I doubt he has anything on Spotify yet. are all the bands from quebec, can we drum up francophone bands from other provinces? I know most every province has little french enclaves… some more than others. I’m not familiar with any in BC or AB but I know SK, MB, ON, NB (only official bilingual prov), NS, PEI and even NFLD have fully french communities. And Radio Radio is as far as I can recall, originally from the French Shore in Nova Scotia (along the Bay of Fundy, towns of Clare and Meteghan) but they are also for sure Montreal based. Yes I welcome all suggestions of other French Canadian artists from any province or territory. Just fired up the playlist now @Darbar.. thank you! And Garf too. I found La Bottine Souriante and dubmatique. Dead Obies has just enough French in there for me to accept it. Radio Radio is awesome… always crank it when they come on…. I just added a song from a group I found out about when I was in Katimavik in 82/83, Harmonium. The record was from the 70s so it isn’t a recent one but I loved that album. I just listened to it again recently and still love it. I could add one of Jill Barber’s French songs. @Darbar … do! RE Jill Barber. If you’re adding English singers who are singing songs in French, you could also add Quand Les Hommes Vivront D’amour by Serena Ryder from the If Your Memory Serves You Well. Great! I will look them up! That Karkwa song is on already but I will look up the others. Thanks! Bernard Adamus is on there already as well but a different song. I like the We Are Wolves one. Once you run out of French music, don’t forget to think about Thanksgiving themed songs. I will attempt to get them in some kind of order unlike this list where there was absolutely no order to it. A side thought about the American election: whoever wins, the loser’s fans are going to be some pissy for a few years. Before going “full ugly” in preparation for the (no) second term! Please resume your previous thought. I really like Pierre Kwenders. I remembered him from being introduced to him through Polaris Music Prize last year. Western Music Awards are coming up next week so I added some of the nominees from that. @garfielduk that is a rather creepy image! fit’s the bill for here but … are we a bit creepy around here? @Morgana, That’s Lana’s old Thanksgiving image. I’m thinking of asking her if we can use it for the playlist post. @FT well I can give Dead Obies a miss. I hope my youth of today will as well. Last night my 15 year old asked if I thought she could dress up old enough for me to sneak her into the upcoming A Tribe Called Red show. “Awww, I would if I could sweetie!” She totally could but I don’t don’t want to open that can of worms now do I!! @garfielduk I did recognize her for some reason. Ask her for the image and suggest she drop by for a visit! Thanks morgana! I am keeping it to French songs this time around. I will check out your list for some french songs. Haha Garf! I love that photo. I’m about half way through the playlist. It’s superb! Thanks again DarBarSpecial! I found Pomplamoose a couple years back and enjoyed their videos. Thanks for reminding me. It’s Friday, is everyone off drinking beer already? @Garf… Gin & Tonic’s then…. Yo Russ… is there any special drink or booze in Detroit or Windsor that us rest of North Americans and UK’ers don’t know about? I am 25 minutes away from beer! Hopefully I can make it! @Garf… that beer looks good man! I still need Thanksgiving suggestions! Haha no worries morgana. I didn’t make that very clear apparently. @garfielduk yes it is rather terrifying raising a teenaged girl but I count it as a win that she talks to me about all of the terrifying things out there. You just reminded me I wanted to come up with a name for these themed playlists like the weld/meld thing. @Darbs…. DBP’s…. (Darlene’s Badass Playlists….). Thank F it’s Friday, let’s get Fused! @Justin 13:27 – The NEW Stroh’s is pretty tasty! Russ… Cool about Stroh’s! I thought you were trash talkin’ for a minute, but I watched that video, pretty cool! Have you tried it yet. The article stated that Pabst owns these regional beers like Stroh’s and here in the Pacific Northwest, Ranier. If they did this with Ranier that’d be awesome too. @morgana – I struck out when I was looking. I won’t be deleting that playlist any time soon. Justin…It was hard to find at first, I found TWO six-packs a couple of weeks ago and then a whole two-four yesterday. It’s good…like a Bohemian pilsner should taste.